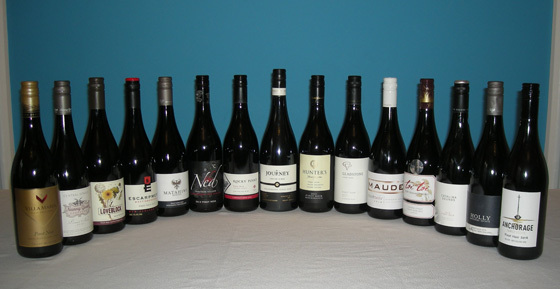 The Fifty Best held a “blind” tasting of 16 recent release New Zealand Pinot Noirs with 15 members of our wine judging panel. Strict tasting rules were applied. The order of service was established beforehand by lottery. Each of the wines were poured into fresh wine glasses from new sealed bottles. Only ice water and white peasant bread were available to cleanse the palate. Hand-picked and machine-harvested grapes were fermented in a combination of open vats and stainless steel tanks, with aging in new or 1-2 years-old French oak barriques. Aroma: Fresh cherry, cranberry, rich red fruit, dried cherry, cherry cola, floral, mushroom, spicy, leather, mineral, oak, musky, earthy, wet forest floor, dusty earth, smoky, zippy. Palate: Cherry, juicy red plum, cassis, wild strawberries, floral, black pepper, spice, vanilla, leather, wet leaves, wet stones, wood, oak, slightly tart, well balanced. Finish: Black cherry, perfumed, light green pepper, soft, delicate, elegant, beautiful integration, complex yet ethereal, balanced, spot-on New Zealand Pinot Noir. This wine was produced from grapes grown in selected vineyards in the Awatere and Southern Valleys of Marlborough. Fermentation was conducted using a combination of indigenous and cultured years, after which the wine was aged from 10 months in a combination of new and used French oak. Aroma: Blackberry, raspberry, cherry, red plum, candied cranberry, green pepper, mushroom, anise, chocolate, slight oak, damp soil, earth. Palate: Ripe red plum, spicy plum, raspberry, currant, herbal, pepper mineral, Old World, well-balanced, juicy, rich, chewy. Finish: Slightly herbal, smooth, juicy, classic Pinot, rich, complex, balanced. Several clones of Pinot Noir grapes grown on a variety of rootstocks were used to fashion this wine, with different batches of fruit processed separately. Following fermentation, the wine was aged in French oak barrels (about 35% new) for 10 months, after which individual barrels were blended before bottling. Aroma: Dark cherry, cherry, black cherry, raspberry, red currant, cranberry, stewed fruit, cola, sweet vanilla, herbs, herbaceous, olives, pepper, leather, mineral. Palate: Cherry, sour cherry, black cherry, raspberry, blueberry, red berry, red plum, tart red currant, herbaceous, pepper, forest floor, sweet tannins, complex, loaded with flavor. Finish: Fruity, floral, vanilla, smooth, juicy, flavorful, tart, lush, good structure. Grapes for this wine hailed from a single vineyard – managed to provide maximum sun exposure. Following “tank fermentation”, the wine was aged in French oak (23% new) for 10 months prior to bottling. Aroma: Ripe red berry explosion, ripe raspberry, mulberry, black cherry, blackberry, plum, currant, complex fruit, raspberry-coated vanilla, cola, light herbs, super herbaceous, dill, mint, mushroom, oregano, nice balance, varietally correct Pinot Noir. Palate: Black cherry, teaberry, lush berries, dark fruit, ripe fruit, fruit-forward, vanilla, Coca-Cola, bell pepper, black olive, spicy, forest floor, pine needles, earthy, juicy, soft, well balanced, signature New Zealand Pinot Noir. Finish: Cherry, olive, spicy, soft tannins, flavorful, smooth, nice structure, balanced, will evolve. This 100% Pinot Noir is a blend of hand-harvested fruit from two Southern Valley vineyards (55% from Sound of White Vineyard in the Waihopai Valley and 45% from Clayridge Vineyard in the Omaka Valley). Following fermentation, the wine was aged in French oak barriques. Aroma: Tart cherry, cherry, red fruit, dried cherry, cranberry, raspberry, tiramisu, cola, rose petal, sage, leather, mineral, damp soil, earthiness. Palate: Blackberry, black plum, red currant, stewed plums, fruit punch, Hawaiian punch, maraschino cherry, green fruit, herbal, full flavor, expressive minerality, smoky, nice acidity, soft round tannins, silky, elegant, lively. Finish: Cranberry, black cherry, dry fruit, menthol, tart, flavorful, smooth, excellent balance, soft tannins balanced with acidity, elegant, complex, ethereal. Grapes for this wine were primarily from Clutha Vineyard (near Cromwell), with a small portion from Mount Dunstan. Following early morning harvesting, the grapes were fermented in stainless steel and aged for 6 months before bottling. Aroma: Black cherry, red cherry, fresh berry, raspberry, black raspberry, cranberry, plum, stewed strawberry, cherry cough drops, brown sugar, lavender, light vegetal, light green pepper, mint, light spice, hay, earth, forest floor, mineral, wet coffee grounds, tannic. Palate: Black cherry, red cherry, cranberry, blackberry, unripened strawberry, mulberry, mineral, salty, earthy, low tannins. Finish: Raspberry, spicy, peppery, slightly tart, needs time. This wine is a blend of a number of clones of Pinot Noir from the Matahiwi Vineyard that following fermentation, was aged in both tank and barrel for 12 months before blending and bottling. Aroma: Red cherry, black cherry, cranberry, raspberry, ripe plum, bright fruit, maraschino cherry, cherry cola, vanilla, cocoa, sweet spice, pepper, mineral, new oak, rich. Palate: Black cherry, cherry, raspberry, cranberry, red plum, soft rounded fruit, dark fruit, unripe red berry fruit, vanilla, cherry cola, oak, juicy, rich, silky. Finish: Cherry, fruity, floral, vanilla, medium tannins, sweet tannins, soft tannins, thirst-quenching, mouth-watering, complex. To make this wine, hand-picked Pinot Noir grapes from Ben Morven (noted for deep clay soils) were fermented and aged for 9 months in French oak before bottling. Aroma: Cranberry, berry, raspberry, cherry, plum, orange peel, slight perfume, lavender, vegetal, leather, earthy, barnyard, varietally correct. Palate: Dark cherry, black cherry, black plum, plum, ripe dense raspberry, cranberry, currant, citrus, white pepper, spice, baker’s chocolate, Willamette Valley spice without the complexity, mineral, earth, forest floor, juicy mouthfeel, high acid, well balanced, structured. Finish: Juicy, cherry cola, light spice, tart, clean, delicate, mineral, elegant. Hand-harvested Pinot Noir grapes from a number of vineyards including Mt. Maude in Wanaka were used for this wine. Following traditional fermentation in open top tanks with indigenous yeasts, the wine was aged in French barriques (30% new) for 10 months and bottled without fining or filtering. Aroma: Cranberry, ripe berries, red cherry, plum, flowers, green pepper, mushroom, menthol, cinnamon, black pepper, chocolate, wet leather, damp soil, oak, old wood, smoke, dusty, varietally correct. Palate: Red berry, red cherry, deep grape, dark fruit, cherry cola, herb, Indian spice, mineral, slightly tart, nice acidity, silky, meaty for a Pinot, classic. Finish: Cherry, flavorful, nice acidity, very nice structure, well balanced, great. Ben Morven vineyard (noted for rich clay and loam soils) provided 80% of the hand-picked grapes for this wine, with the remainder from Slopes Vineyard. Following fermentation, the wine was aged for 11 months in French oak puncheons and bottled unfined and unfiltered. Aroma: Black cherry, cherry, plum, blackberry, concentrated raspberry, stewed cherry, candied cranberry, candy apple, coca-cola, pepper, coffee, leather, mineral, wet stone, forest floor, smoky. Palate: Red cherry, tart cherry, strawberry, red currant, stewed berries, jam, cherry cola, balsamic, new oak, earth, slightly tart, rich, soft, light tannins. Finish: Tart, sweet, rich, soft velvety tannins, high acidity, good balance. This wine was fashioned from slow ripening grapes grown on 9 year-old vines planted in a vineyard noted for limestone substrate. Aroma: Cherry, pomegranate, plum, stewed stone fruits, herbal, coffee, leather, earthy, smoke. Palate: Cherry, dried cherry, bramble berries, strawberry, fresh berries, black plum, orange, herbaceous, fresh cut grass, peppery, tobacco. Finish: Lemon zest, fresh strawberry, grassy, earthy, nicely balanced, refreshingly light, very nice, elegant. For this wine, hand-picked grapes were sourced from Prophet’s Rock Estate (primarily the steep Rocky Point Vineyard). Following fermentation, using indigenous yeasts, the wine was aged on its lees in French Burgundy oak before bottling. Aroma: Red cherry, sweet cherry, deep ripe raspberry, dark berry, stewed berry, sweet compote, poblano pepper, truffle, green herbs, sage, herb, mint, chocolate, wet leather, mineral, dusty earth, earthy. Palate: Sweet cherry, cherry, cranberry, dark berries, ripe sweet fruit, mint, mineral, oaky, gripping tannins, soft, silky, gentle. Finish: Flavorful, mouth-watering, soft, balanced. For this wine, small patches of the vineyard yielded hand-picked fruit that was fermented with indigenous yeast after which the wine was aged for 10 months in oak (29% New French barriques) prior to bottling. Aroma: Fresh cherry, red berry, strawberry, raspberry, green fruit, floral, green olive, sweet vanilla, chocolate cake, muted mineral, oak, damp earth, musty, smoky, delicate, unique Pinot nose. Palate: Cranberry, red cherry, red plum, soft red fruit, cherry cola, herbal, green vegetable, peppery, spicy forest floor, earth, woody, oak. Finish: Cherry, green apple, tart, peppery, earth, balanced, lingering tannins, silky, elegant. Made from 100% Pinot Noir grown on the Escarpment and MacCreanor Vineyards (at 165 feet above sea level), this wine was fermented over a period of 16 days and then aged for 11 months in French oak barriques (25% new). Aroma: Fresh cherry, cranberry, raspberry, candied strawberry, faint candied cherry, balanced fruit, floral, lavender, herbaceous, mushroom, underbrush, forest floor, Swiss roll, oak, dense, slight tannins. Palate: Bright tart berries, black cherry, cherry, green fruit, juicy, floral, vegetal, mineral, oaky, dry, rich, firm, round tannins, nice body, varietally correct. Finish: Cherry, some tannin, pleasant, good balance. The grapes for this wine were from the Someone’s Darling Estate in Bendigo that were pruned for a very low yield. Following fermentation, the wine was aged for 8 months prior to bottling. Aroma: Deep black cherry, cherry, raspberry, dark fruit, peach, high-toned fruit, stewed fruit, floral, sweet perfume, thyme, vanilla, strong leather, bright minerality, dusty, varietally correct. Palate: Cherry, red plum, light berry, tropical fruit, balanced fruit, muddled fruit jam, candied cherry, berries in liqueur, red pepper, earthy, cocoa, dusty, juicy, tannic, well put together. Finish: Slightly sweet cherry, berry dominated, tart, spicy, nice balance of alcohol and fruit, elegant, complex, ethereal. The grapes for this wine (primarily French Dijon clone 667) were fermented on the skins to dryness and immediately transferred to barrels and tanks for aging. Aroma: Raspberry, red berry, cherry, blueberry, red Jolly Rancher, kirsch liqueur, vanilla, cola, chocolate frosting, mint syrup, smoky, mushroom, damp soil, new oak. Palate: Cherry, black cherry, red cherry, raspberry, juicy black plum, blueberry, currant, cooked berries in liqueur, well balanced.